Battery life has always been an issue with iPhones, but the dual component sourcing of the iPhone 6s A9 SoC put the whole matter into a new perspective: since early tests published on PrimateLabs’ website showed phones with Samsung chips scoring lower than those with TSMC chips, people started wondering which versions they have in their latest purchases. The issue even caught Apple’s attention, so it issued a rare comment, saying the difference between iPhone models with any combination of components is no more than 2-3%. The guys over at Ars Technica happened to have two iPhone 6s models with A9 chips from both manufacturers, so they compared the battery life of those devices using Geekbench 3, WebGL, GFXBench GL 3.1, and WiFi browsing. Here is what they have found: while the iPhone with the Samsung SoC had consistently lower battery life compared to the TSMC version, there was an exception — as you can see from the chart inserted above — and that was the WebGL test. While there is a slight difference between the two devices, the test results confirm Apple’s statement, because there was no more than a 3% difference between them. So there are definitely circumstances under which the TSMC phone will last longer than the Samsung phone, but it’s not a universal problem. A Samsung chip that’s mostly idling or even one under modest CPU and GPU load, though, is going to behave in just about the same way as a TSMC chip. And the kinds of CPU-intensive work that the Samsung chip seems to struggle with just aren’t that common on smartphones. Most of the time, iPhone 6S battery life should be similar no matter which chip your phone is using. 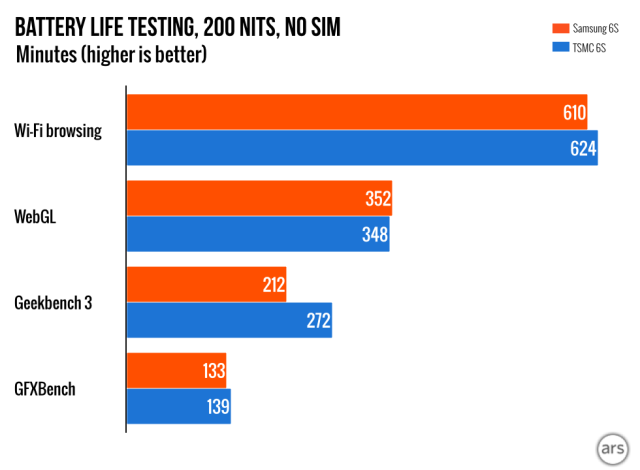 It should be noted — as highlighted by AnandTech earlier last week — that these tests in controlled environments have their limitations, which in Ars Technica’s case is the sample size: it involved only two devices of the more than 13 million units that are already out in the wild.